you.” 29 So Mary immediately went to him. they assumed she was going to Laz­a­rus’s grave to weep. have you put him?” he asked them. the stone aside,” ­Jesus told them. heaven and said, “Father, thank you for hearing me. public ministry among the people and left Je­ru­sa­lem. of Ephra­im, and stayed there with his disciples. ­Jesus must report it immediately so they could arrest him. money, he often stole some for himself. our position; Greek reads our place. 11:49 Greek that year; also in 11:51. 300 denarii. A denarius was equivalent to a laborer’s full day’s wage. a reason the gospel was being shared. He was a walking miracle. 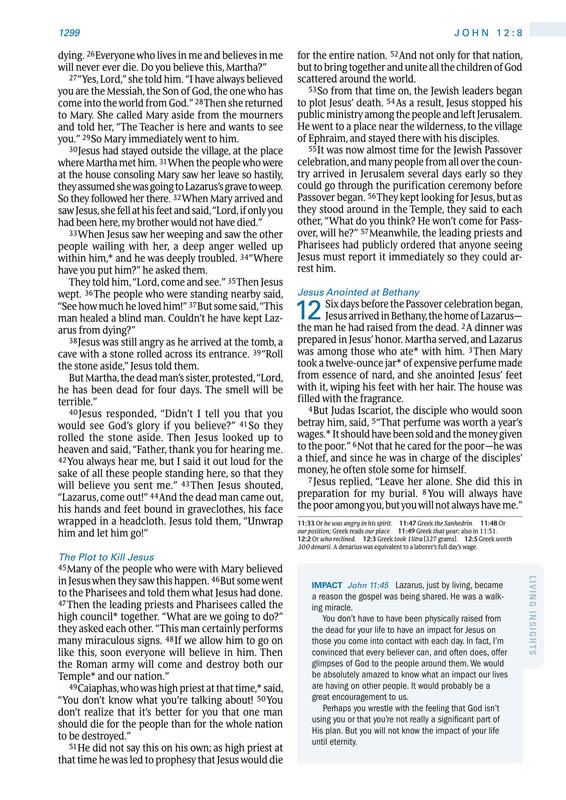 to the Phar­i­sees and told them what ­Jesus had done.